Puppy socialization is an art form but sadly, there are dog trainers that fail to understand that not all puppies are the same. Throwing a bunch of puppies together and expecting them to play nicely is not the way to approach puppy training. Puppies are all different sizes and individual temperaments. Introductions need monitoring to watch for shyness or bullying. Only when a puppy is confident of his ability to cope, can you let him run with the other pups. Genetics can produce nervous or anxious behaviour. However, you can help him to develop coping strategies for managing his issues. In this article, we are going to explore various treatments for your dog’s behaviour. Fear aggression – your dog barks and lunges at other dogs and/or people. This is often confused with pure aggression. What appears to be aggression is often rooted in fear. The dog reacts defensively to keep away the object of his fear. Although the above list of behaviour appears to be variable, the foundation for overcoming the issues is similar. Dog psychology is NOT the same as human psychology. If your child were scared, you would soothe him, reassuring him that he need not be afraid. Your child would hug you and feel comforted. With a dog, your efforts to reassure him merely compound his fears. By cuddling him, you are reinforcing the behaviour. For instance, a young dog hearing his first clap of thunder may jump and hide under the table. Naturally, you try calming methods by stroking him and using soothing words. The next time he hears thunder, he will seek that reassurance because he believes there is something to be afraid of because you inadvertently highlighted the fear by your behaviour towards him. It is best to ignore the behaviour – do not make a big thing of symptoms of fear. If your dog reacts to thunder, simply carry on with what you were doing. Ignore the dog for a few moments and then do something to distract him. If he loves playing with a ball, encourage him to play. In this way, you are teaching him a positive association with the thunder. It might seem counterintuitive to you, but this is how a dog thinks. If this happens outside of the house, ensure that your dog is safe. When scared, a dog may run away so put him inside the house or on a lead. Although you are ignoring the behaviour, it is important to put your dog in an environment where he normally feels safe. For fear aggression, barking at objects etc. Your dog has to learn that you will protect him. In his moment of fear, despite he may be barking and lunging, he is terrified. To explain this, we are going to portray a typical example of a dog that is reactive to other dogs. If you are seeing any of the above signs, your dog is preparing to react. His physiology is responding to the trigger (dog in the distance) and his responses will escalate as you walk closer to the trigger. Observe your own behaviour. Are you doing any of the following? Observe how far away you are from the trigger and make a mental note. Is it 50 yards, 100 yards, or more? With a happy voice, call your dog, say ‘this way’ and turn and walk the opposite direction to the trigger. Look down at your dog and observe when the physiological symptoms have gone. This will usually be when he looks up at you, happy to be away from the trigger. In the beginning, you will be doing a lot of turning around. Gradually, the distance for the reactivity to the trigger will reduce – within a few months the original 100 yards may reduce to 25 yards or less. The success of the training will depend on your consistency and approach. Your dog thinks you are the best thing since sliced bread because you have proved that you understand him. You have protected him by removing him from scary monsters. Your dog will develop a stronger bond to you. BAT is a fabulous training method for the fearful or anxious dog. At the same time as you are working through this treatment, it is a great idea to teach your dog an alternative behaviour. Sit or a down is a calming behaviour that will reduce his reactivity. Carry treats with you and give him a treat when he is calm and happy. Over time, your dog will learn to sit and look at you whenever he sees the trigger and, later, the trigger will be able to pass by as your dog looks up at you happily assured that he is safe with you, and that he does not need to be anxious or reactive. There can be no set timescale for recovery from anxiety, stress or fear based reactivity but if you work through these guidelines, you can be confident of seeing great improvement in your dog. Thunderstorms, fireworks, vet visits - pets get stressed too! A few drops of RESCUE REMEDY PET can help reduce pet stress without the side effects often found in sedatives. 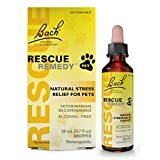 Veterinarian recommended RESCUE REMEDY PET is a blend of 5 BACH ORIGINAL FLOWER REMEDIES, in a pet-friendly, alcohol-free formula. Each ingredient, chosen for its unique ability to ease mental tension - Rock Rose, Impatiens, Clematis, Star of Bethlehem, and Cherry Plum - is sourced directly from the original gardens of Dr. Bach. Simply add four drops to your pet's food, water bowl or on a treat. It can also be rubbed onto your pet's' ear, nose or paw. Repeat as needed. Suitable for dogs, cats, horses, rabbits, birds, and lizards. The dosage of RESCUE REMEDY PET does not depend on the weight or type of animal. RESCUE REMEDY PET is not a sedative, so find the dosage that works best for you and your pet. 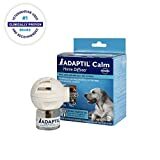 VET RECOMMENDED: Adaptil is the #1 Vet Recommended solution to help dogs adjust to challenging situations and curb stress-related unwanted behaviors. DRUG-FREE SOLUTION: The diffuser emits an odorless pheromone that provides a strong signal of comfort and security to dogs. CLINICALLY PROVEN: May be used to help reduce separation anxiety and fear of loud noises (thunderstorms/fireworks), increase focus during training sessions or adapt to new surroundings. COVERS UP TO 700 SQ FT: To maximize effectiveness, replace the refill vial every 4 weeks and the diffuser head every 6 months. 100% SATISFACTION GUARANTEE: All dogs are unique, results may vary. (Note: packaging may differ slightly). CALMS 99% OF DOG-RELATED ANXIETIES - Our natural calming treats are proven to alleviate symptoms of dog-related stress and anxiety. Whether your dog suffers from separation anxiety, weather-related woes, exhibits other types of nervous behavior, or is simply hyperactive, PremiumCare can help put your dog at ease. RELIEVES ANXIETY IN STRESSFUL SITUATIONS - Our calming treats work to reduce symptoms of anxiety such as excessive scratching, barking, chewing, licking and salivating. DOG APPROVED FLAVOR - Our soft chews taste like treats without any added fillers such as corn, dairy, soy and artificial colors and ingredients. MONEY-BACK GUARANTEE - We are so confident that you will love our calming treats that if you are unhappy with it for any reason, we will fully refund your purchase, no questions asked!